Stuck for Christmas present ideas? Why not try Breakout! Christmas is fast approaching, and everyone knows at least one person who is difficult to buy gifts for. 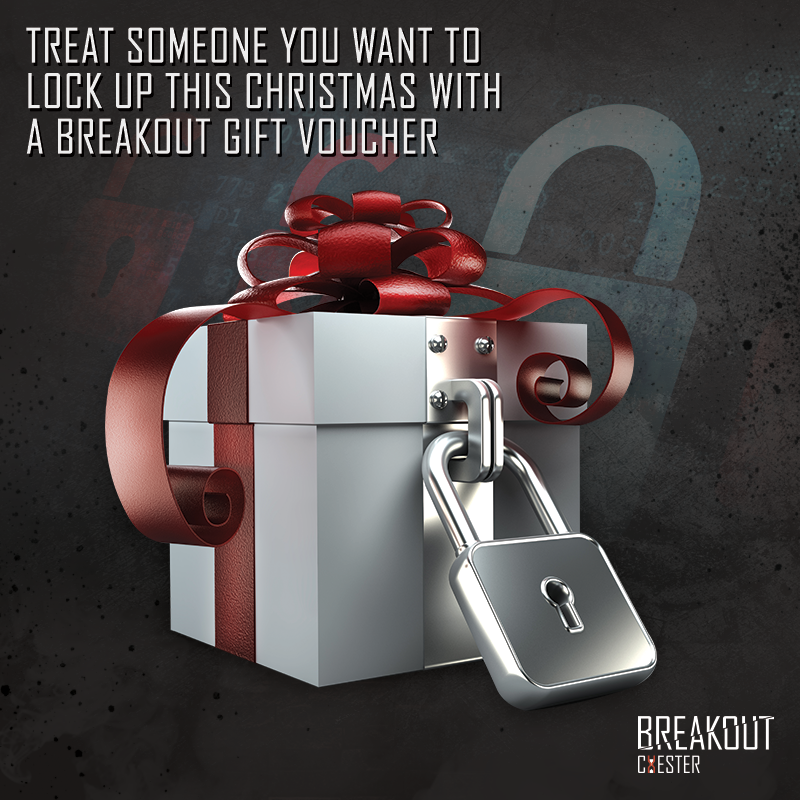 Whether you're sick of buying soap, candles and socks, a game at Breakout can be a great alternative present. Our games are the perfect gift for that fussy friend or family member - we lock them in a room for an hour and test their brain power with our puzzles, riddles and clues to see if they can escape. It's much more exciting than yet another rainy-day boardgame, with the bonus of our rooms being toasty warm while the Winter weather keeps us all indoors. Group sizes can range between two to five players in a room, so you can even come along to play with whoever you buy the game for (if they want you on their team, that is!). You can either book directly and send them off, or you can phone whichever city interests you and ask them to email you a voucher after you've purchased the game! With a wide variety of difficulty levels in our rooms, you can even choose how challenging you want the game to be. So if you want to test how clever your family members really are, you could go for a five-star difficulty room like Sabotage (in Manchester, Liverpool and Cardiff) or Madchester (in Manchester). Or if you want to be kind and start them off with something easier, our three-star rooms like Identify (in Chester), Cursed Carnival or The Detective Office might be the best place to begin. If you know someone who has been down to play our games before and are keen to return for another round of escaping, they might enjoy a medium level of difficulty such as our four-star rooms Virus, The Facility or Wanted so they can put their skills to the test yet again. There's also the option of choosing your room by theme based on what your friend or family member would enjoy more - got a cousin who is a massive fan of the seven seas an all things pirate-y? Then Shipwrecked in our Liverpool centre would be perfect! The team of treasure hunters are to sneak on board the wreck of the Soldado, haunted by the ghostly Captain Chivers - steal his treasure within an hour and live to tell the tale, if not then become part of the skeleton crew! Or if you have a friend who is a big fans of crime dramas, then Cardiff's newest room would be the perfect gift to buy for them. In Disturbed, the team discover a gruesome crime scene in a warehouse, the last known whereabouts of PC Richards who has been missing for over a week. Investigate the scene and work out what happened to make your escape! With our centres being based in city centre locations in Manchester, Liverpool, Cardiff and our newest addition in Chester, you can easily make a day of treating that special someone who already has everything! You could add a game of Breakout to the list of activities for the day as each game lasts for an hour, so if you're giving the gift of a day out in the city, a stop off at Breakout can be a nice break from the cold weather of the Christmas markets or a way to get your brain into gear after a meal out. We're open from 10am to 10pm seven days a week, so even if the person who receives a game with us a gift is always busy, it should be easy to find a time that suits them to come down and play! If this is your thing then visit the website of the city you're interested in sending your loved ones to now!